This morning the Sydney Morning Herald site seems to have had a few problems. 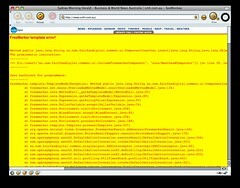 The homepage displaying pages of Java error messages in place of articles (in a nice bright red and yellow). At all seems to have been rectified now, but I can see what the problem may have been… It looks as though the writer of the article Infiltrating the party womb drunk a little too much coffee, leaving the rest of the site short. This entry was posted in News, Web sites and tagged error, Java, smh. Bookmark the permalink.